As Tropical Storm Sandy intensifies in the Caribbean, likely to reach hurricane strength before striking Jamaica on Wednesday, weather forecasters are warily watching its potential to impact the U.S. East Coast in a major way. 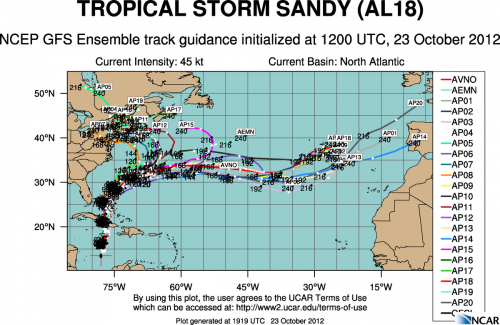 Many computer model simulations of Sandy’s eventual path continue to show a rare event taking place early next week in which Sandy may tap into an intense area of energy at the upper levels of the atmosphere, and then evolve into an extraordinarily powerful nor’easter, the likes of which the Mid-Atlantic and Northeast have not seen in many years. A simulation from the European computer model, showing the major storm in New England on Oct. 30. 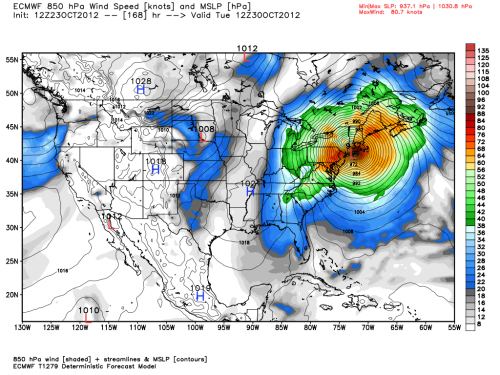 Some computer models, such as the one built by the European Center for Medium Range Weather Forecasts (ECMWF), are showing that the storm could be near hurricane intensity when it strikes land somewhere between Virginia and Maine, almost a year to the day since the Snowtober storm struck the same area. Map illustrating the variability within individual model runs of one particular computer model, each run with slightly different atmospheric conditions. 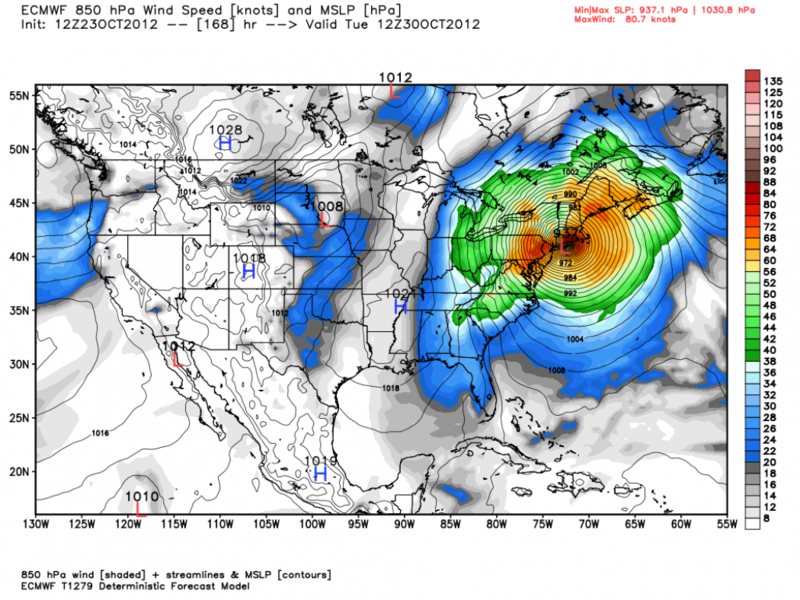 Several runs show a clear threat to New England from Tropical Storm Sandy. Because several other computer models still show a far more benign scenario in which Sandy is drawn northeastward from the Bahamas and heads out to sea, perhaps posing a threat to Bermuda, forecasters are not portraying the East Coast scenario as as sure bet. But they're warning the public to pay close attention to forecasts. Both scenarios — or something in between — are still very much in play, and will likely remain so until Thursday or Friday, when computer models get a better handle on a kink in the jet stream soon to come ashore in Western Canada, which will play a key role in how this situation plays out. Eventually, the jet stream is going to dive southeastward, carving out a huge area of colder than average temperatures across the center of the U.S., with the Arctic air pushing east just as Sandy is offshore. As of Tuesday afternoon, it appeared that New England is at highest risk of seeing major impacts from a storm, whereas the Carolinas and Mid-Atlantic could receive more of a glancing blow. “Residents of the Northeast, perhaps, should be most concerned. The European model - which did the best job simulating hurricane Isaac’s track in late August - delivers a devastating blow from central New Jersey to southern New England (including New York City), with Long Island and southern Connecticut ground zero. The simulation puts the storm’s minimum central pressure below 940 mb, which is the equivalent of a dangerous major hurricane,” wrote meteorologist Jason Samenow of the Capital Weather Gang blog. Because of the potential for major impacts, the National Weather Service has already begun briefing emergency managers. On Tuesday, the NWS forecast office in the Philadelphia published a severe weather briefing which cited the threats of damaging wind gusts, very heavy rainfall, inland flooding, and coastal flooding. The briefing also noted that the storm could have a very large wind field, and may expose coastal areas to several high tide cycles with flooding issues. “The area affected will be determined by the track of the storm. There is still considerable uncertainty about the track of the storm, but our region is clearly at risk,” the briefing said. Stay tuned to Climate Central as this storm threat evolves. We'll have a roundup of forecasts and computer model projections on Wednesday morning, with updates as needed.